Happy Saturday! My forgetful memory and I forgot to wish you Happy Thanksgiving! I reckon you’re probably stuffed right now of delicious turkey, cranberry sauce and pumpkin pie and I am also so very jealous that I decided to push even more food to you in the form of a lifestyle post! 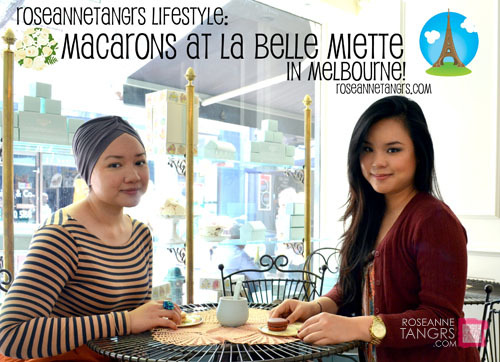 Today I’m taking you down Hardware Lane with Ilyana to a small quaint french looking patisserie selling what I think are the best macarons in Melbourne. 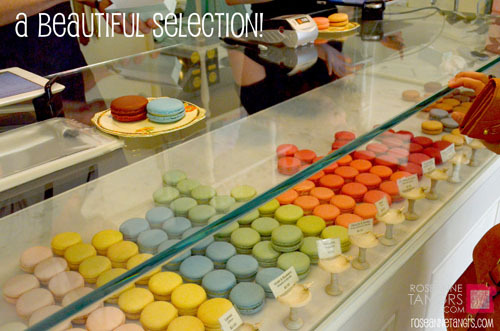 The name La Belle Miette is actually french for “beautiful small thing” or “beautiful crumb” which is fitting because it sells primarily macarons. In fact, these are I think the only delectable bites that they offer. 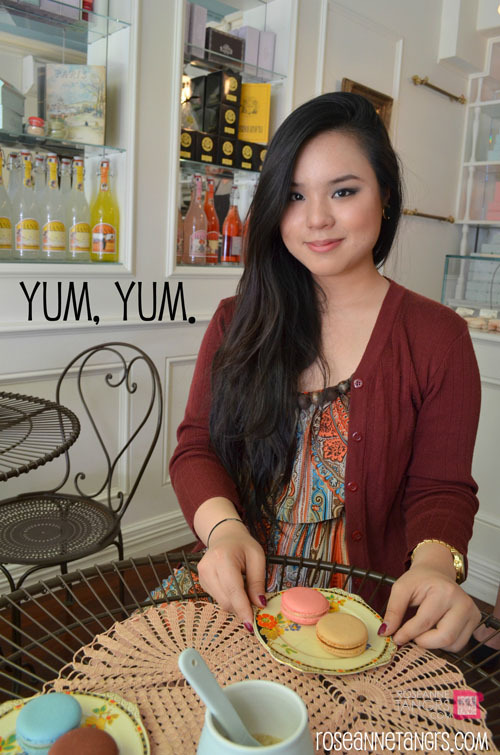 The small patisserie was founded by a couple, Maylynn and Hugh. 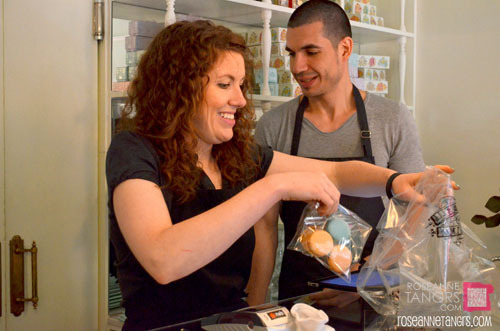 Maylynn and Hugh are both passionate bakers and dessert enthusiasts who studied professional patesserie in Paris so no wonder their macarons are amazing. Isn’t the shop front cute? It’s a very come in, grab your macarons and go sort of concept. 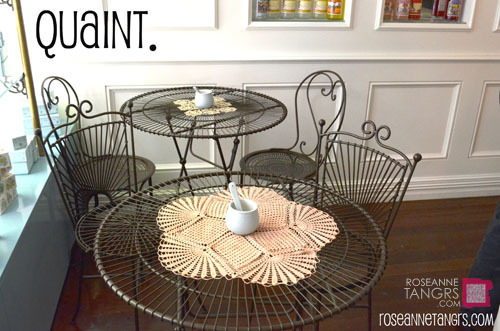 But there are little chairs if you’d like to sit down and have your macarons on fine china instead. The design of the store is absolutley beautiful, parisian, quaint and just plain “lovely”. You’re greeted by two lovely macaron sellers to help you out. Nope, this isn’t Maylynn and Hugh! 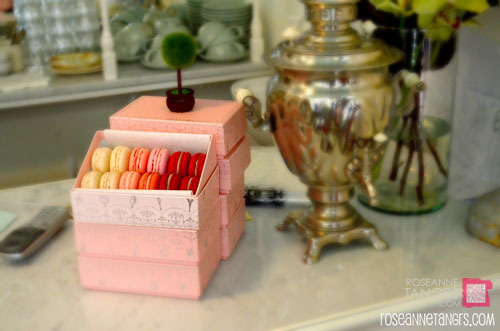 La Belle Miette provides a bunch of really awesome flavours including Violet and Blueberry (my favourite), Pimm’s and Pomegranate, Mariage Freres Earl Grey Chocolate, Cherry Blossom & Sake and even ‘Bastille’ – Moet et Chandon and Blackcurrant. I haven’t gotten to trying everything but I can imagine they’d all taste pretty amazing. I chose the Violet and Blueberry and the 72% Cocoa Single Origin Chocolate (Venezuela) to kill off a little chocolate craving I was having. I am absolutely in love with the Violet and Blueberry. If you don’t know what a macaron is, it is a sweet french confectionary that’s made with sugar and egg whites and filled with various fillings. It tends to be crunchy on the outside but soft and chewy in the inside. 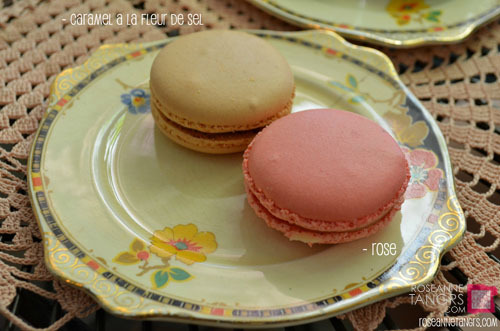 Ilyana chose the Caramel a la Fleur de Sel and the rose macarons! Look how pretty they are. I have tried them and the rose is a unique flavour. Quite like bandung for everyone out there who knows what that rose syrup drink is! 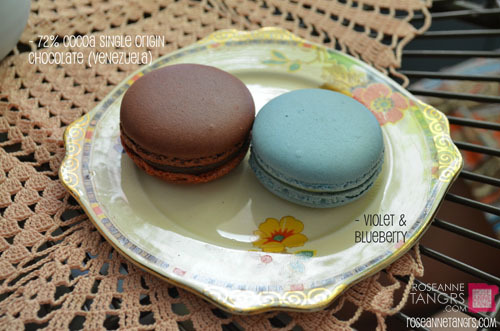 The Violet and Blueberry is my favourite macaron. 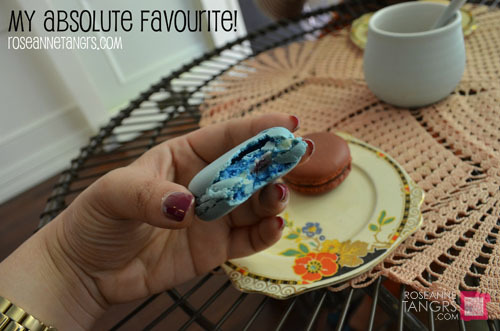 My friends aren’t really a fan but I absolutely love the blueberry filling inside that seems to be tangy and sweet. My 72% cocoa macaron is a strong chocolate kick! 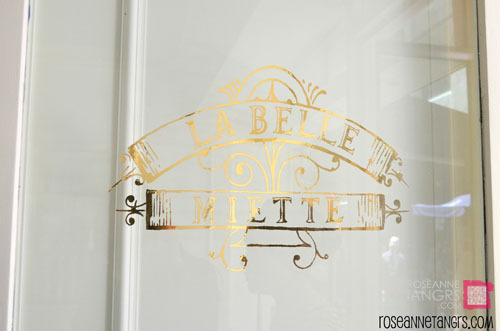 Overall, La Belle Miette is a great place to satisfy a royal sweet tooth and a place you should for sure visit in Melbourne when you can! 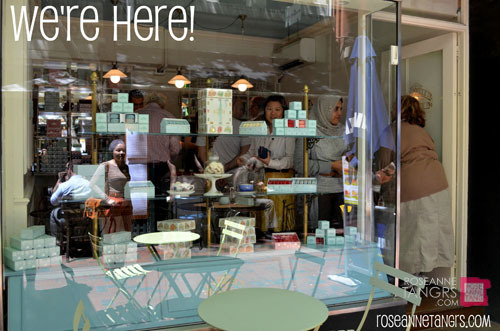 You can find LaBelle Miette in Melbourne at 30 Hardware Lane! Hope you enjoyed this post! 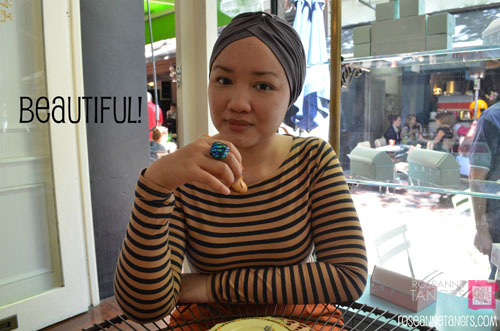 Remember to share it with your friends, fb like it or retweet it! New Free Phone App I love! – SGMALLS! 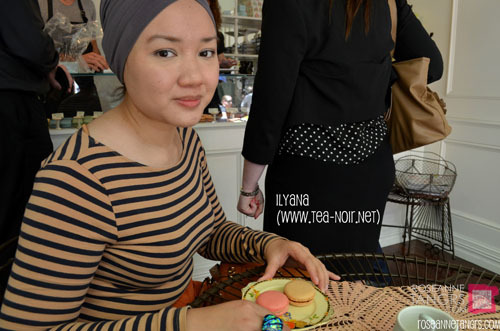 Yay for macarons! I had such a lovely time with you that day hon 🙂 I’m actually thinking of buying some in one of those fancy boxes they have the day before my flight home so I don’t miss them so much haha!